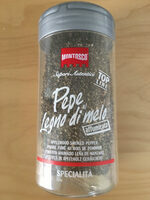 APPLEWOOD SMOKED PEPPER (GB) The slow cold smoking process with applewood enhances its pungent aroma. Its unique taste, is excellent on Pasta Carbonara and on all the dishes that need the smoky flavour. Product added on March 20, 2019 at 11:41:26 AM CET by vincenzof. Last edit of product page on March 20, 2019 at 12:11:24 PM CET by vincenzof. Product page also edited by roboto-app.